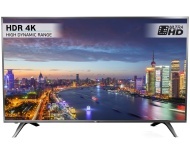 alaTest has collected and analyzed 20 reviews of HISENSE 43N5700. The average rating for this product is 4.8/5, compared to an average rating of 4.6/5 for other products in the same category for all reviews. People are impressed by the design and sound. The price and image quality are also mentioned favorably. We analyzed user and expert ratings, product age and more factors. Compared to other products in the same category the HISENSE 43N5700 is awarded an overall alaScore™ of 89/100 = Very good quality. Great features! Value for money! This very nice TV showed very good features and quality. It is very good value for money. Glad I bought it as easy to use and I can read any wording now. Generally very pleased with the TV but disappointed that there is no on/off switch, which means switching it off at the wall socket or leaving it on stand-by. Just purchased this tv. Excellent spec, at a great price! !